As the search continued in Giant Ghost City, Bai Xiaochun led the Giant Ghost King through one teleportation formation after another. Not a single one led them 50,000 kilometers outside of the city. Bai Xiaochun had no choice but just keep trying to find that particular formation. As a result, the glow of teleportation could be seen popping up all over the city. The cultivators of the three great clans and the soldiers of the six heavenly marquises’ armies were all aware of what was happening. Although they were shocked to discover that there were so many teleportation formations within the city limits, there was nothing they could do about it. Gritting their teeth, they continued the search, many of them rushing toward the nearest glowing light that indicated a teleportation was underway. After entering the most recently discovered formation, they were teleported into a courtyard residence in the east part of the city. Almost as soon as they began to materialize, whistling sounds filled the air around them. As it just so happened, the chief of the Chen Clan was leading a group of three clan elders, and a large contingent of other cultivators from the clan, to search the area. As soon as the light of teleportation appeared, they raced over to find Bai Xiaochun and the Giant Ghost King coming into view. They attacked immediately, unleashing numerous divine abilities and magical techniques, as well as calling upon the power of sundry magical items. In the blink of an eye, all of that force was bearing down on Bai Xiaochun. Bai Xiaochun’s face fell. Having no time to activate the spell formation again to teleport away, he dragged the Giant Ghost King backward. A resounding boom filled the air as the courtyard residence they had just been in disappeared, replaced by an enormous crater. As other buildings in the area collapsed, Bai Xiaochun became a series of afterimages that shot away at top speed, Giant Ghost King in tow. However, in almost the same moment that he took to motion, a huge banner suddenly slammed into the ground in front of him. A blood-colored fog immediately spilled out, spreading in all directions to block his path. Within that fog, it was possible to see thousands upon thousands... of blood-soaked children! All of them were between four and five years old, and dripped with blood as surely as if they had been skinned alive. Their eyes shone with desolation as they stared at Bai Xiaochun, screaming and weeping bitterly. The bizarre wails almost instantly became like an attack on the soul! At this point, the Giant Ghost King’s eyes began to flicker with fury. The Myriad Children Blood Banner was created by sacrificing the lives of 100,000 children. It was classified as an evil treasure, something so barbaric that, even in the Wildlands, it was viewed as a violation of natural order. Furthermore, it was formally banned, the type of thing that came with strict punishments if it were used. And yet, the chief of the Chen Clan had gone so far as to create one, and recently at that. Because he was unfamiliar with its usage, he couldn’t draw upon its full powers, but even still, the blood fog it created was so potent that anyone who breathed it in would be instantly sent into a nightmarish hallucination. When Bai Xiaochun saw all of the rancorous, blood-soaked children, his heart twinged with pain, and his eyes began to shine with killing intent. It didn’t matter where this item appeared, it would arouse the wrath of gods and men alike. It didn’t matter that this was the Wildlands; as soon as Bai Xiaochun saw the item, he couldn't control his wrath. A tall, slender man walked out into the open. He appeared to a bit over forty years of age, handsome, with the demeanor of a transcendent being. However, his eyes were cold and sinister, revealing the cruel and vicious nature of his personality. He was none other than the chief of the Chen Clan, and even as his words echoed out, he performed an incantation gesture with his right hand, then waved his finger. Instantly, the blood fog seethed, and the thousands upon thousands of blood-soaked children screamed and rushed toward Bai Xiaochun. At the same time, the clan elders and other cultivators from the Chen Clan released their own attacks, causing rumbling sounds to fill the air. Bai Xiaochun’s expression flickered as he quickly performed an incantation gesture to summon his Eternal Parasol. As soon as it opened up, he charged toward the clan chief using the Mountain Shaking Bash. “Back the hell down!” the clan chief said with a cold laugh. Waving his sleeve, he unleashed the power of his Nascent Soul cultivation base, causing three children to appear within the fog who were soaked with so much blood they looked almost violet. Each one of them radiated the power of the Nascent Soul stage as they screamed and charged toward Bai Xiaochun. Rumbling sounds echoed out as Bai Xiaochun roared in rage, dragging the Giant Ghost King with him as he took a step forward, accelerating with such blinding speed that everything around him slowed down. By the time he finished taking his step, he was only nine meters from the chief of the Chen Clan. “Die!” he shouted, clenching his right hand into a fist and punching out with all of the power of his fleshly body and cultivation base. At the same time, a mark appeared on his forehead, which was none other than his Heavenspan Dharma Eye. As everything in the area shook violently, the clan chief’s face fell; he had been aware that this Bai Hao was incredible, but had never imagined that he would be capable of speed like this. “Blood Children Detonation! !” he shouted. The charging blood children screamed in pain as they began to explode, creating a blast of energy that bore down rapidly on Bai Xiaochun. It became like an enormous blood-colored mouth that opened up as if to consume him. By now, Bai Xiaochun’s veins of steel were on full display. He knew that if he didn’t come out on top in this encounter, he would be in extreme danger. Without any hesitation, he snapped open the Eternal Parasol, upon which four golden designs could be seen. Glittering golden light shone out in all directions as the parasol grew in size, covering him as he shot through the huge mouth and closed in on the Chen Clan chief with blinding speed. “Time to die!” Bai Xiaochun roared, unleashing the Throat Crushing Grasp. Because of the gravitational force that came along with the technique, the shocked clan chief was incapable of dodging or evading. In the blink of an eye, Bai Xiaochun’s two fingers were almost onto his throat. The clan chief’s ashen face was covered with a look of profound disbelief and shock. However, it was in that moment that an angry shout could be heard from some distance away. “Screw off! !” The sound pierced through the air and exploded out into Bai Xiaochun’s mind, causing blood to spray out of his mouth. To the delight of the clan chief, Bai Xiaochun’s hand trembled, providing him the opportunity to escape. “Patriarch, help me!” he shouted. However, even as he dodged to the side, Bai Xiaochun’s eyes turned more bloodshot than before. Although he had missed the man’s neck, he still managed to latch onto his shoulder, whereupon he twisted his hand viciously. Cracking sounds erupted out, accompanied by a bitter scream as Bai Xiaochun ripped the clan chief’s right arm off of his body. 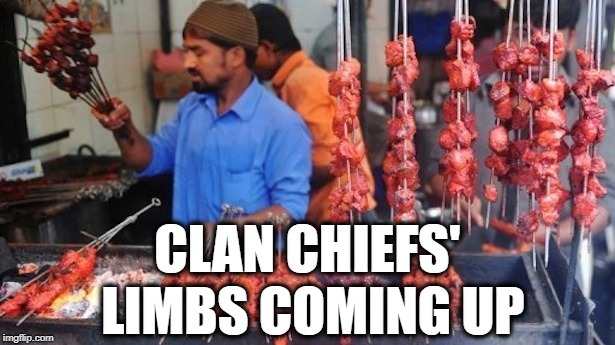 Blood sprayed out everywhere as the clan chief’s face went completely ashen. However, he still managed to fall back at top speed. At the same time, a figure appeared nearby, speeding toward Bai Xiaochun. It was an old man with a Deva Realm cultivation base, who was none other than the Chen Clan patriarch! Gasping for breath, Bai Xiaochun immediately backed up, his eyes flickering with defiance. The Chen Clan chief had forged a blood banner by exterminating countless young lives, something that caused Bai Xiaochun’s heart to swell with fury. Therefore, even as he backed up, he slapped his bag of holding, producing a greatbow with a fourteenfold spirit enhancement! As soon as he pulled back on the bowstring, the area around him became like a black hole, sucking in all of the energy in the area. At the same time, an arrow appeared on the bow which also had a fourteenfold spirit enhancement. Without any hesitation, Bai Xiaochun aimed the bow at the fleeing clan chief, and then loosed the arrow. When he did, an ear-piercing howl could be heard as the arrow transformed into a black dragon, and shot toward the clan chief. Then, Bai Xiaochun turned and fled, not bothering to see what happened to the arrow and the chief. As the clan chief’s face drained of blood again, and a sensation of deadly crisis filled his heart, a cold snort could be heard. Then, the deva patriarch appeared directly in front him. Stepping forward, he reached out and grabbed the arrow. Squeezing his hand down, he completely crushed it! The deva patriarch’s expression was very grim; if he had not stepped in to interfere, he could have reached Bai Xiaochun. However, the brief moment he took to save the chief’s life was all the time Bai Xiaochun needed to flee. The killing intent in the patriarch’s eyes grew more intense, and yet at the same time, he had his misgivings. He was still unsure of all the techniques at Bai Xiaochun’s disposal, who had just seriously injured the Chen Clan chief, and very nearly killed him! Not wanting to suffer the same fate as the Bai Clan patriarch, he performed a double-handed incantation gesture, summoning a large group of ghostly figures, all of them wearing black suits of armor, and all of them radiating the fluctuations of the Nascent Soul stage. Only then did he give chase.